When Pauline Bolton first suggested that they capture time in a capsule, she didn’t think the management at Edgewater Retirement Village would take her seriously. At that point of time she had no clue about the amount of work and research that goes into putting memorabilia into a capsule that will be opened in 50 years. Soon a committee of enthusiasts wanting to contribute to a time capsule was formed. A lot of brain-storming and talking to the conservation department at the Auckland Museum later, the nifty team of seniors were wiser. Bev Macnaughtan, who is an ace at scrapbooking and has spent many man hours creating lots of beautiful scrapbooks for the village, says that they had to use acid free paper with no staples or paper clips. While there were a couple of naysayers, the go-getting team wasn’t going to allow a couple of discouraging remarks dampen its enthusiasm. Instead they divided the jobs between them and got working on things that were of interest to them. 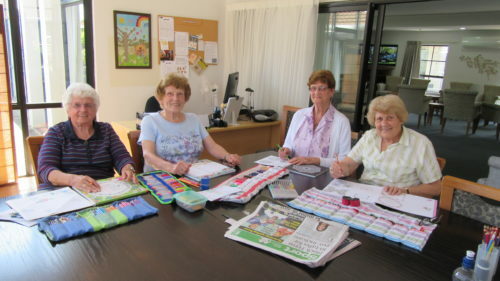 Bev worked on fashion and the style quotient of their times while Adrienne Jury, a skilled artist, did what she does best, sketch cartoons and impressions of the retirement village for posterity. “How we do our banking, transport, medical care, films photographs of various activities, trips, sport, TV guides and the Herald as well as the Howick and Pakuranga Times have all be fitted into the glass capsule,” says Pauline. Helen Paton says this was their chance to have a bit of a laugh and a gossip…even as they wondered where the time capsule will be put down. Everyone contributed to it depending on the talent they had– and everything was acceptable, they say. The glass container was sealed with a marine grade sealant to stand the test of time. There was plenty of plumber’s tape to go around it. A specially designed box to keep the jar stable and safe was built by grounds and maintenance manager Bruce Pholprasert. Bruce built a special planter box with a plaque and fixed the time capsule at the bottom so that it is easily accessible. 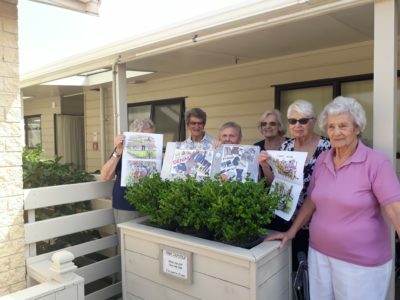 The planter now has a special place of pride at the retirement village which is currently going through major renovations. “Fifty years later, the residents of the village will open the capsule and discover how we lived,” smiles Pauline who is currently looking for another major project to take on.